"Since the Islamic revolution in Iran 29 years ago, Iranian athletes have been forbidden to compete against Israelis. It happened in 2001, when an Iranian judo athlete refused to face an Israeli in an international competition. It happened in the 2004 Games in Athens, when a world-class judo athlete named Arash Miresmaeli mysteriously failed to make weight for his match against an Israeli competitor. And then it happened again here with the swimmer. It should have gotten the entire Iranian delegation booted and banned from the games until they change their tune. Instead, the IOC's gutless lapdogs shrugged. For the second straight games, the Iranians have made a mockery of the games, and still, the IOC refuses to do what it has long needed to do: Throw them out. Olympic dreams die in different ways, all of them painful. At least Israel's Tom Beeri had a chance. His Iranian competitor never had a shot. 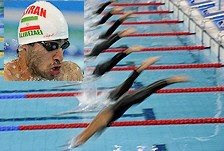 For that, the Iranians should be run out of the Olympic movement, sooner rather than later."